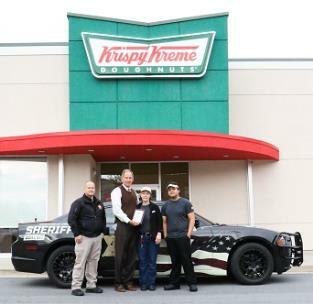 Whitfield County Sheriff Scott Chitwood presented a plaque of appreciation to the Dalton Krispy Kreme on Walnut Avenue, represented by supervisors Darlene Wheeler and Cruz Rodriguez, for the store’s support of local law enforcement. Deputy Nathan Center (left), one of the DARE instructors, said the store donates several dozen doughnuts to each of the 13 elementary schools as a reward for the students at the annual DARE graduation ceremonies. The DARE (Drug Abuse Resistance Education) program aims to help fifth graders make good choices about drugs and envisions a world in which students everywhere are empowered to respect others and choose to lead lives free from violence, substance abuse and other dangerous behaviors.